Lately I have been thinking about the life lessons my grandmother taught me. Growing up, my maternal grandparents lived a block away from my childhood home. I was blessed with the gift of having their presence and influence in my life. Today my grandmother is 95, her health is beginning to fail. Yet, she possesses a resiliency and tenacity that I believe will be a part of her being until her last breath. One of Grandma's life principles is you choose how you show up for life. Each morning, regardless of where the day would take her, she would arise, put on a nice outfit with coordinating accessories and jewelry, fix her hair, and put on makeup completed with lipstick. Grandma grew up in the depression, and she knew how to stretch a dollar. On a tight budget, she successfully made sure she always looked put-together. In my teenager years, I did not understand the reason she seemed so fixated on how she looked. She would often remind me of the importance of "dressing your best for church" or "putting on a little lipstick" when I went out. At the time, I thought her motivating factor was vanity. Although, even then, I knew this did not make sense because she was also one of the most humble and generous people I knew. Even when my grandfather became very ill and my grandmother was his primary caregiver, she kept to her morning routine. She'd arise each day, put on a nice outfit with coordinating accessories and jewelry, fix her hair, and put on makeup completed with lipstick. I remember once I asked her why she did this knowing that some days she did not even leave the house. Her response was, "I do it for me." It was not until recently that I asked her what she meant by this statement. She explained, "When I put on a nice outfit, put on some nice jewelry, fix my hair and put on my face, especially on the days when I didn't want to get out of bed, it helps me face the day. When I clothe myself and put on my face, I feel different. I become a little different. I know I can face the day, whatever it may bring." My grandmother's perspective and words reminded me of something Lauren Winter wrote in her book Wearing God: Clothing, Laughter, Fire, and Other Overlooked Ways of Meeting God, "I become professional or hip, depending on what I am wearing. I feel different when I am wearing different clothes. I act different. I let my Talbots suits and my vintage shirts remake me in their image. I want to let Jesus do the same." He was inviting the readers to imagine clothing themselves in the image of Christ. It is a beautiful image. Imagine how differently we might see the world and how differently our lives might be if each morning, regardless of where the day would take us, we would arise and consciously clothe ourselves in the image of Christ. Imagine if we began each day with putting on compassion, kindness, humility, gentleness, and patience. Imagine if we began each day with a commitment to forgive. And above all, imagine if we began each new moment with choosing to wear love in all times, in all places, in all situations and with all people. 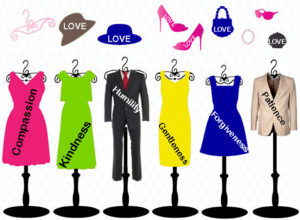 Imagine if we became what we decided to wear, when clothed ourselves in the image of Christ. Holy and beloved ones, may we arise each day and clothe ourselves with compassion, kindness, humility, gentleness, patience, forgiveness, and above all, love.